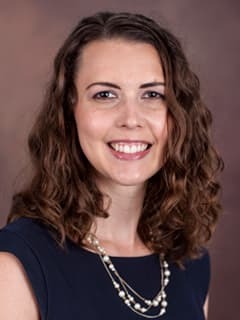 Megan Dougherty MA, RD, CSP, LDN, CNSC, is an Inpatient Clinical Nutrition Manager in the Department of Clinical Nutrition at Children's Hospital of Philadelphia. Wright E, Dougherty M, and Drabouski K. Lipid Disorders. In: Corkins M, ed. The A.S.P.E.N Pediatric Nutrition Support Core Curriculum. 2nd ed. Silver Spring, MD; 2015:221-230. Barnes S, Dougherty M, Girten M. Case Study. Presented at: Children’s Hospital of Philadelphia Dietetic Intern Class day; January and May 2016; Philadelphia, PA.
Dougherty M. Pediatric Nutrition Assessment. Presented at: Children’s Hospital of Philadelphia Dietetic Intern Class Day; May 2015; Philadelphia, PA.
Barnes S and Dougherty M. Pediatric Anthropometrics. Presented at: PASPEN’s Spring Conference 2015; May 2015; Philadelphia, PA.
Dougherty M. Pediatric Nutrition Assessment. Presented at: Children’s Hospital of Philadelphia Dietetic Intern Class Day; January, April, and December 2014; Philadelphia, PA.
Dougherty M. Nutrition in the Premature Infant. Presented at: College of Saint Elizabeth Pediatric Nutrition Conference; November 2014; Morristown, NJ. 2016, Unique Experience Award for Poster Presentation at the Pennsylvania Academy of Nutrition and Dietetic Association’s Annual Meeting, Pittsburgh, PA.